You'll enjoy skiing and hiking right outside your door, and Superior National Golf Course less than two miles from your condo rental. The Alpine Condo at Caribou Highlands is a ski-in/ski-out condo located in Caribou Highlands Resort. You'll love this home away from home because it is a corner unit on the top (3rd) floor, with amazing views of the Superior National Forest. 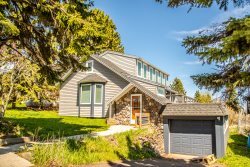 This cozy condo is the ideal getaway for a weekend ski trip or a summer time home base for your North Shore explorations. This condo has a full kitchen, cozy wood burning fireplace, SAT TV and WiFi, plus two full bathrooms. So whether you stay here spring, summer, fall or winter you will want to come back again and again. Also, enjoy the private balcony that faces the outdoor swimming pool and the boreal forest beyond. You are just minutes away from many North Shore attractions! This is a ski-in/ski-out unit for the popular Lutsen Mountains Ski area. This puts the mountain right at your back door. During the summer, the Alpine Slide and Gondola are popular attractions. Superior National at Lutsen Golf Course is just a mile down the road and features a full golf course in the summer and miles of fat bike trails in the winter. At the Alpine Condo you are surrounded by miles of hiking trails and a short drive to Temperance and Caribou State parks. Grand Marais, with many quaint gift shops and dining options, is just 20 miles up scenic Highway 61. Cap off a long day of skiing or exploring by dining at Moguls Grille & Tap Room, the resort restaurant and bar, or at Papa Charlie's Restaurant & Tavern at Eagle's Ridge Resort right next door. Both feature live music from popular area musicians throughout the year and are easy walking distance to the condo. Just down the road, a short drive away, is the Lakeside Dining Room and the Poplar River Pub at Lutsen Resort serving breakfast, lunch, and dinner (including a full breakfast buffet). Many other dining options are available along the shore. Or stay at home and enjoy a meal in your renovated kitchen or have a summertime BBQ using one of the community grills. Proximity to the ski locker and skiing was great-very convenient. The room was very clean and comfortably accommodated 2 adults and 4 teens. Hey Cascade Vacation Rentals, we really enjoyed our stay at the Ski in Ski out location in the Old Caribou highlands Building. So convenient to the ski hill, Papa Charlies, Moguls and everything at Lutsen!